Raptor-2. The return of Raptor. 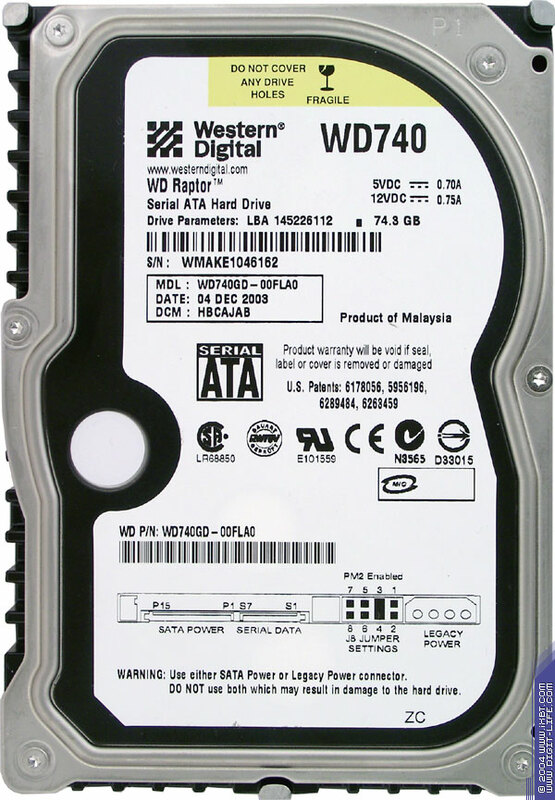 In less than a year Western Digital launched an extension of its extraordinary Raptor drive. Officially it's not Raptor 2, but for simplicity we will call WD Raptor WD360GD - Raptor, and WD Raptor WD740GD - Raptor 2. 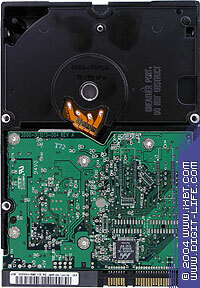 At its time WD360GD was the first SATA drive with the spindle speed of 10,000 rpm. 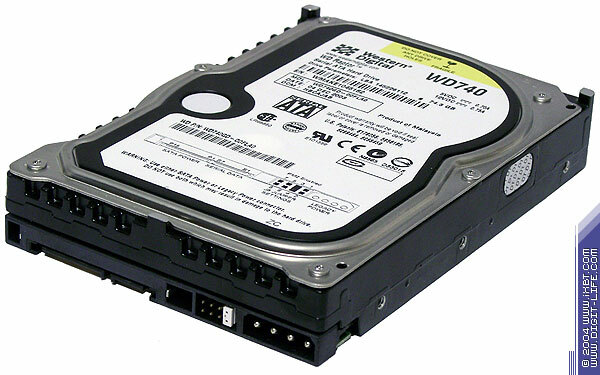 Moreover, there are no more hard drive makers that produce such drives. What changed except the disc size? First of all, the new version has a doubled size due to one more platter. The platter write density hardly changed, but the linear density is increased and it must have a positive effect on the linear read speed. Secondly, the average read access time was reduced from 5.2 ms to 4.5 ms, i.e. by 0.7 ms! Thirdly, WD740GD supports Ultra/150 Command Queuing technology (Ultra/150 CQ) which optimizes the command queue. Finally, the FDB motor must improve drive's acoustic characteristics. The changes are not few but if it improves the drive's performance we will see later. Unfortunately, the PATA-to-SATA bridge from Marvell (Marvell 88i8030-TBC) is inherited from the first drive. By the way, it's located on the outer side of the disc board. Also, you can use any power supply cable type (standard 4-pin or special 15-pin SATA) and proprietary cooling fins. 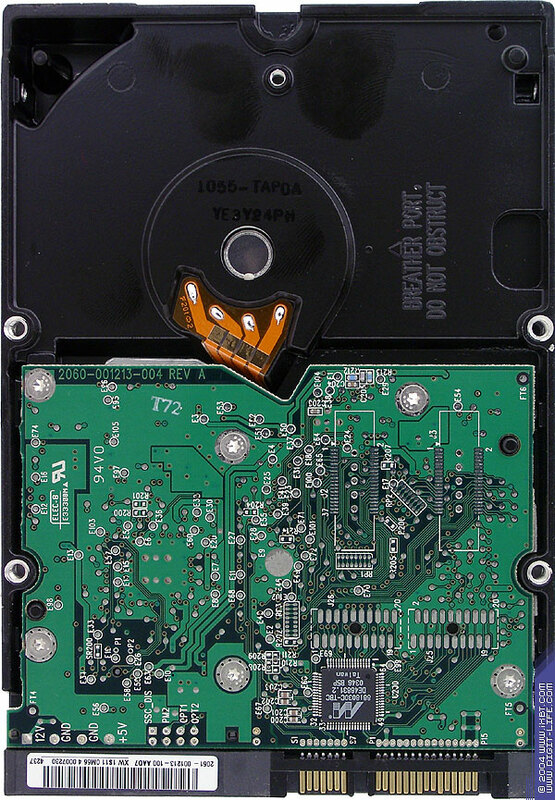 The Ultra/150 CQ is actually an analog of SATA 1.0 Tagged Command Queuing (but not SATA II Native Command Queuing), which in its turn was transferred to SATA from PATA (or rather ATA-4). All these technologies manage the command queuing optimization but it also requires a controller which could understand such commands. At the moment there are two chips supporting the command queuing management - Marvell 88SX60xx and Silicon Image SiI 3124 (both support SATA 1.0 Tagged Command Queuing and SATA II Native Command Queuing), but they haven't reached our lab yet. Raptor 2, Raptor, Cheetah features. 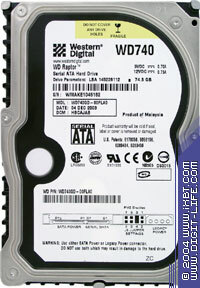 * Note the mistake at Western Digital's site where they indicate that the drive has one platter and two heads. The drives have different interfaces, and the tests were carried out on two testbeds. The test suite is standard. Excellent! 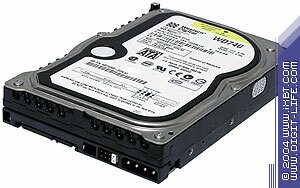 The SCSI drive is beaten in all aspects, WD360GD falls behind by 25% at the beginning and over 40% at the end of the disc. Brilliant scores. Besides the best linear reading the newcomer proves to be a good stayer - the first time the linear read speed drops at the 21-23GB mark, the second time at 39-40GB (which is over the half of the disc), and the speed falls down only by 3MB/sec by the 39GB mark which is a very pleasant achievement. (As far as I remember, only Fujitsu MAS53367NC SCSI 15K drive whose size is four times smaller size could boast of similar stability of linear reading along half of the disc). The Raptor 2 outscores the old man by 0.7ms in the average access time, and, which is more important, has a 0.2ms advantage over the SCSI 10K drive. In WinMark Raptors do not differ much from each other but they are far ahead of Cheetah. Both testbeds use the same processors, and only the mainboard or RAM can cause any changes. However, judging by the experience, WinMark is a weak point for Seagate drives. Now come the synthetic tests. In Intel IOMeter the situation is completely different. Seagate Cheetah is beyond the competition (Raptor 2 marginally beats it only at the linear loads), the new Raptor has only a 5-10% advantage over the older solution at all loads and falls far behind the 10K SCSI model. 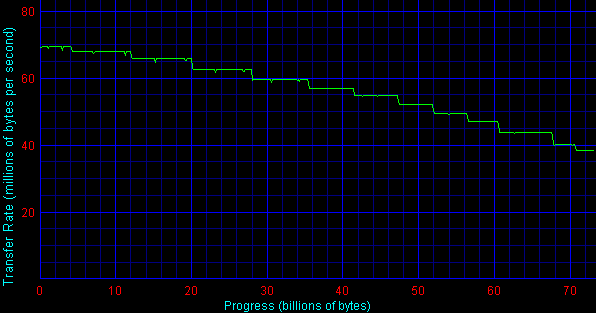 It happens because of the command queuing optimization which is implemented for SCSI and only announced for SATA. Both SATA drives go on a par, while Seagate's solution keeps ahead but this modest breakaway is caused rather by traditional flaws of Seagate's team whose drives often have the worst results in write speed tests. 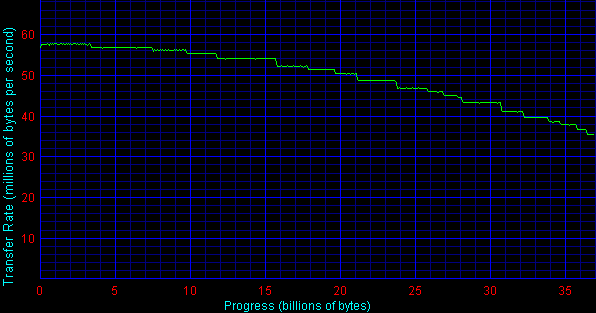 For the low loads the situation is the same, and only at 100% writing Raptor 2 falls behind the SCSI drive. Again there's some gap between the 10K SCSI model and SATA devices, and the gap is wider at the queue depth of 16 than at the maximum load. 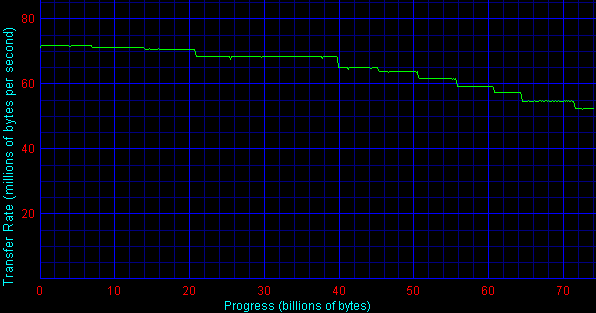 Starting from the queue depth of 32 the performance of the SCSI drive freezes (the controller's parameter, here you can get more info about it), while the SATA drive keeps on increasing its scores. According to WinMark, WD740GD takes the first place, and Seagate's model is behind by 3MB/sec, and according to IOMeter, the Seagate outscores the Raptor 2 by 4MB/sec. Noteworthy is the fact that all three drives reach the maximum at the block size of 8KB, and behave identically at the lower size. Again Raptor 2 takes the first place "thanks" to Seagate's flows. Both Raptors reach the maximal performance at the block size of 16KB, and Cheetah reaches it at 8KB. In the physical tests (linear read speed, average access time) the new Raptor got excellent scores beating both its predecessor and 10K SCSI drive from Seagate. According to WinMark the newcomer considerably outperforms the first Raptor, and beats the SCSI drive by a good margin too. In the synthetic tests the new Raptor takes a 5-10% advantage over the old man but both are far behind Cheetah. So, the new Raptor looks better than the old solution in all parameters, raising the bar of maximum performance for desktop-class drives. On the other hand, it's still too early to affirm that more efficient SATA versions are pressing SCSI drives out of the market (even from the 10,000 rpm sector). Besides, it is of much interest to see the Command Queuing for SATA.